At the end of last month, we had a look at three Radeon X800 XL’s from Club3D, MSI and Sapphire, all of which hugely impressed us. In fact, the Radeon X800 XL is a very good competitor to NVIDIA’s previously untouched GeForce 6800 GT. ATI have struck back with something that performs on par and better in many cases, for a considerably cheaper price – the only thing that we really feel that it lacks is the Shader Model 3.0 support and both full 32-bit and partial 16-bit floating points to allow for state of the art technologies like high-dynamic range rendering that we have seen in FarCry and Splinter Cell: Chaos Theory. At the end of the roundup, we overclocked the three video cards and came up with some interesting results whereby the Club3D Radeon X800 XL overclocked considerably further than both MSI’s and Sapphire’s, which incidentally topped out at roughly the same clock speed. Our initial thoughts were that the Radeon X800 XL really benefited from the additional power connector when overclocking, but cooling could come in to play with overclocking the video cards individually. Also, there is no way to guarantee that both the MSI and Sapphire Radeon X800 XL’s cores were as receptive to overclocking as the core from Club3D. 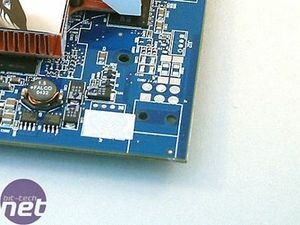 There were a number of comments that we received regarding the additional power connector on Club3D’s card, stating that it wasn’t a requirement and that if the supplementary power source were unplugged, the card would operate as normal. 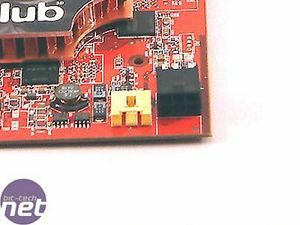 The additional power connector on the Club3D video card is something that prompted us to write this follow up article, after a more detailed investigation in to the overclocking habits of the X800 XL’s from Club3D and Sapphire had been conducted. The budding question that many of you have wanted to know the answer to is whether or not the additional power connector on Club3D’s Radeon X800 XL is a requirement, or indeed of any use. Today, we are hoping to find the answers to these questions and hopefully be able to come to a reasonable assumption by the end of the investigation. 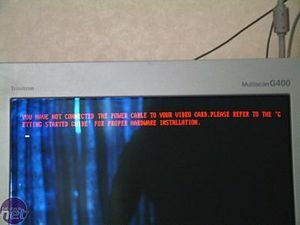 YOU HAVE NOT CONNECTED THE POWER CABLE TO YOUR VIDEO CARD. PLEASE REFER TO THE ‘GETTING STARTED GUIDE’ FOR PROPER HARDWARE INSTALLATION. We think that answers the first question fairly bluntly – we won’t be running any game tests on the Club3D Radeon X800 XL without the power cable plugged in. Over the next couple of pages, we hope to establish exactly what is holding the Sapphire Radeon X800 XL back, and hopefully establish whether Club3D's decision to add a supplementary power connector is a beneficial one in terms of its willingness to overclock. We know how well the GeForce 6800 GT can overclock, with the majority of cores reaching the realms of GeForce 6800 Ultra clock speeds, and this article should help us establish whether something similar is possible with the Radeon X800 XL. We used the latest Catalyst drivers, version 5.3, which are available to download from ATI's homepage. The drivers were left at their default settings, with the exception of Vsync, which was disabled during testing. For overclocking the video cards, we used RivaTuner - our favourite video card overclocking program, mainly due to its completeness and wide range of configuration options. It also works for both ATI and NVIDIA video cards. In order to verify that our attained clock speeds were stable, we used a continuous loop of a FarCry time demo to ensure that the video card did not artefact or lock at the increased clock speeds.